Economics has come under scrutiny for its gender inequality. This column presents evidence that female economists form different co-authorship networks which are related to lower research output. The impact of differences in risk-taking on decisions on co-authorship can explain the observed patterns, while discrimination and preferences for same gender collaboration cannot account for them. Gender inequality in the workplace has attracted considerable attention in recent years. There has been a particularly lively debate in the world of economic research, spurred by recent work (e.g. Hengel 2017, Mengel et al. 2018, Sarsons 2017, and Wu 2017). In a recent paper, we provide a systematic analysis of long-term trends in gender inequality in economic research (Ductor et al. 2018). We use the EconLit database, a bibliography of 1,627 journals in economics compiled by the editors of the Journal of Economic Literature, over the period from 1970 to 2011. Over these four decades, economics has undergone a profound transformation. 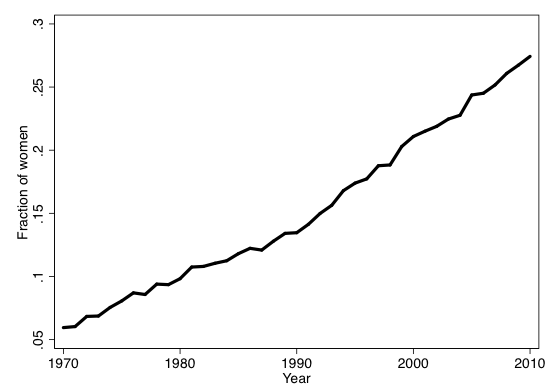 There has been a massive increase in the number of journals (from 252 in the period 1971-1975 to 1,260 in 2006-2010) as well as in the number of authors (from roughly 16,000 in 1971-1975 to 105,000 in the period 2006-2010). This increase has been accompanied by a significant change in the share of women in the profession: the fraction of female economists grew from 8% to 29% over the period we study (see Figure 1). But, after a fall up to 1990, the research output difference between men and women has remained essentially unchanged until 2011: men have produced 50% more output than women. Indeed, there remain large differences in output even after controlling for experience and choice of field (and other observable factors). This motivates an examination of alternative explanations. Research is very much a collaborative activity: individuals discuss ideas with each other, present work to colleagues, and use the feedback to improve the quality of their work. Increasingly, they co-author with others. It is natural then to suppose that the collaborations of an individual will shape their performance. Lindenlaub and Prummer (2017) develop a theoretical model to study the interplay between networks and performance. They show that the number of connections (degree) facilitates access to new ideas, while a higher overlap among connections (greater clustering) and repeated interaction (stronger ties) sustains greater peer pressure and trust. 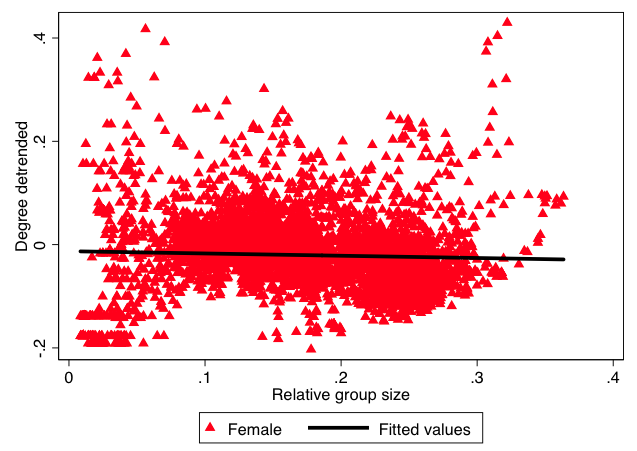 We identify large and persistent gender differences in networks: women have lower degree and higher clustering and strength than men, which suggests that women choose networks that are correlated with lower future output. 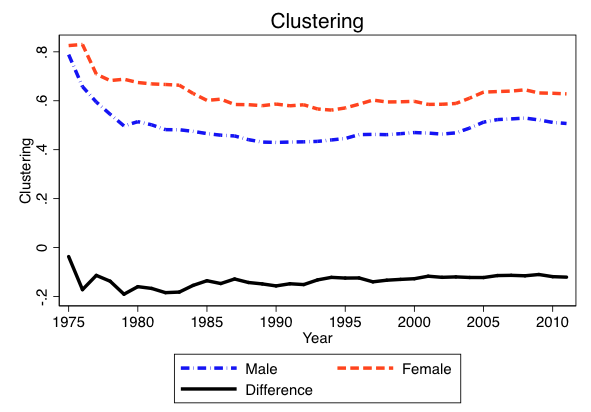 Remarkably, despite the substantial increase in the number of women in economics, the differences in co-authorship patterns have either increased as in the case of degree (see Figure 2) or have remained stable as in case of clustering (see Figure 3). This leads us to the question: Why do women have different networks? We examine two potential explanations: homophily (the desire of women to collaborate with other women, and for men to work with other men) and discrimination (a preference for male co-authors). It may be the case that the difference in degree is mainly driven by homophily and the underrepresentation of women in the profession. This idea has been made precise by Currarini et al. (2009). Their model generates a positive correlation between the relative size of a group in the population and its (average) degree. We test their prediction in two ways. First, we exploit variation in gender shares across time. 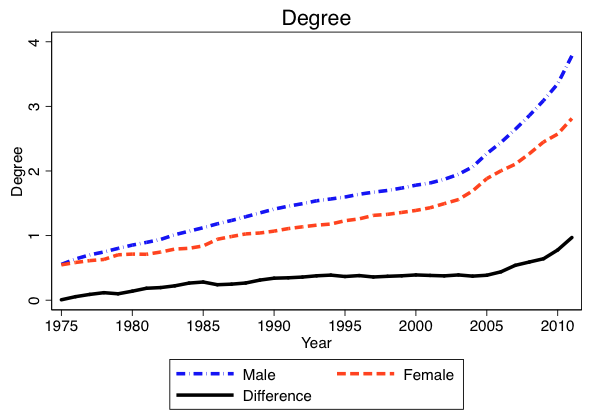 Figure 1 illustrates that despite the increase in the number of women in the profession, the gender differences in the number of co-authors have actually increased. This holds true if we include various controls and is also robust if we consider cohorts instead of years. Second, we use variation in gender shares across fields. Some fields in economics, such as labour and development, have a larger share of women, whereas other fields, such as microeconomic theory, have a smaller share of women. We show that the share of women in a given field does not have a significant impact on the number of co-authors that women have. This is illustrated in Figure 4. So we conclude that homophily is not a good explanation for the difference in the number of co-authors between men and women. We then turn to discrimination. If women face taste-based discrimination – that is, both men and women preferring to work with men – then an economist would work with a female colleague only if there is evidence that she has higher productivity. We assume that this is indicated by higher past output. We find that male co-authors have, on average, a higher past research output than female co-authors for both women and men. This is inconsistent with taste-based discrimination. If women face statistical discrimination, they may be able to overcome this if they have a well-established track record. When comparing the gender gap in collaboration patterns of previously highly productive economists to that of less productive economists, the gender gap does not diminish – an observation that is at odds with statistical discrimination. Thus discrimination is not consistent with the empirical evidence. In addition, we show that women write fewer single-authored papers (that is, a higher share of their research is co-authored) and they co-author more with more experienced and senior economists. As senior authors have greater freedom to choose co-authors, we interpret this as suggesting that discrimination in choosing partners for co-authoring does not drive the differences in collaboration patterns. Having ruled out two natural explanations of why differences in co-authorship persist, we propose that the network differences are a consequence of differences in risk-taking between men and women.1 These differences could be a consequence of disparities in preferences or due to differences in the environment (men and women may receive different rewards from the same action). As a first observation, we note that relatively greater risk-taking by men is reflected in the output data: the variance in output is significantly greater for men compared with women. We then work through the implications of risk-taking for decisions on co-authorship. Suppose men and women with similar ability decide on how to carry out a set of projects: whether to work alone or with others. It is reasonable to suppose that – due to more flexible capacity and breadth of skills – the rewards to joint work are less uncertain than solo work: this suggests a negative correlation between risk-taking and share of research that is co-authored. Similarly, if women face greater adversity when writing on their own, we would expect women to co-author more. This is consistent with our evidence: women write fewer single-authored papers. Moreover, collaboration with senior co-authors is less risky than co-authoring with junior co-authors. A senior-co-author with more experience is likely to have a better sense of whether the idea is promising and how best to approach the work. In addition, there is less uncertainty about the ability and working ethos of senior scholars. So lower risk-taking should be correlated with a higher fraction of senior co-authors – a prediction in line with our data. Finally, we draw out the implications of differences in risk-taking for network structure: someone who takes less risks would be more inclined to continue working with a known collaborator rather than to write a paper with a new unknown person. A lower inclination to take on risks will lead to a greater reliance on introductions through co-authors, leading to a higher clustering coefficient. Taken together, therefore, differences in risk-taking offer a parsimonious explanation for lower degree, higher strength and greater clustering for women. Our study shows that men and women form different co-authorship networks, which are associated to differences in research output. Investigating the sources of these differences allows economists to implement measures to decrease gender inequality. Risk-taking may be due to innate preferences, but it is also influenced by beliefs and perceptions of the environment. Ductor, L, S Goyal and A Prummer (2018), “Gender and collaboration”, Cambridge-INET Working PaperNo. 1807. Hengel, E (2017), “Publishing while female: Are women held to higher standards?”, mimeo, University of Liverpool and VoxEU column. Sarsons H (2017), “Recognition for group work: Gender differences in academia”, American Economic Review: Papers and Proceedings 107(5): 141-45. We also investigate whether network patterns change across a woman's career time, which may indicate differences in terms of family constraints. We find that women's co-authorship patterns are also stable across their career, indicating that while family constraints are certainly important, they do not affect outcomes through their impact on collaboration.